Rangers midfielder Scott Arfield has a surprise cameo of sorts in Nike’s new “Believe in Something” advert, alongside American football quarterback Colin Kaepernick. The clip features Alphonso Davies, a former refugee born in Ghana to Liberian parents, who became the youngest ever footballer to play and score for the Canada national team. In the advert, Davies is shown celebrating his goal with his team mates, including Arfield. 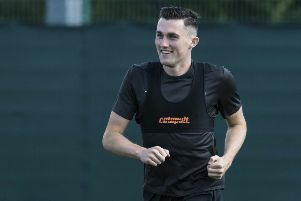 The Rangers midfielder, who joined this summer after leaving Burnley, qualifies for Canada through his Toronto-born father. Nike’s ad slogan is a nod to the 30-year-old Kaepernick, who has taken a much-publicised stance against racial injustice since he began kneeling, rather than standing, during the national anthem ahead of NFL games. Now a free agent, Kaepernick filed a grievance in November last year against the NFL and its owners, accusing them of collusion by not hiring him.